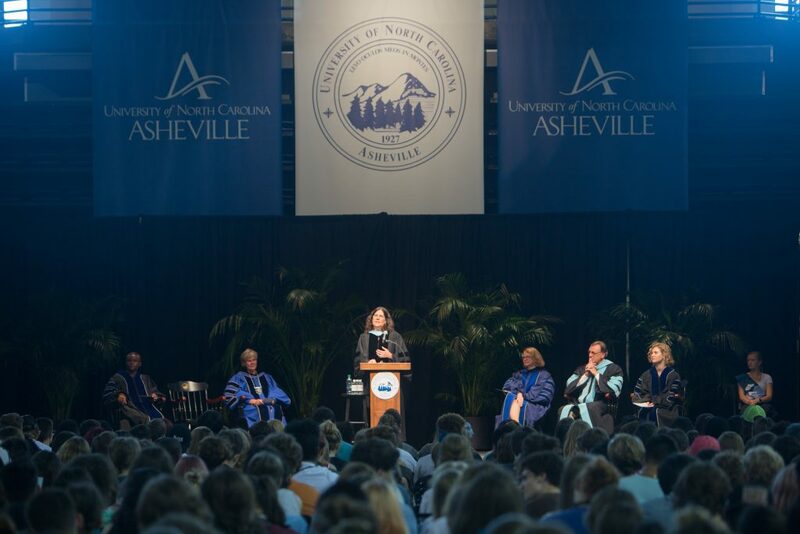 About eight-hundred first-year students and 200 transfer students got a rousing welcome into the Bulldog family at UNC Asheville’s 2018 Convocation, along with a crash course in taking advantage of their own superpowers. Professor of Education Nancy Ruppert addresses the Class of 2022. Professor of Education and the 2017 recipient of the Distinguished Teaching Award Nancy Ruppert identified everyone’s five innate superpowers: “Those who are most successful experience some balance across all five areas: physical, social, emotional, intellectual, and spiritual.” She asked the students in the audience to rate each of their superpowers and tell their neighbors, saying, “Check on one another’s superpowers, because that’s what we do here at UNC Asheville.” To double up on the lesson, she sang parts of the alma mater in the background while students chatted to familiarize them with their new university’s song. 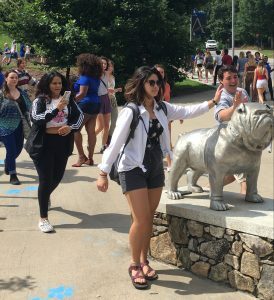 The Class of 2022 pats Rocky the Bulldog for good luck, a UNC Asheville tradition. New students also got some passionate, straightforward words of wisdom from Student Government Association President Michael Davis to be true to themselves, get involved on campus, and seek out the knowledge of their faculty members. Eighty-five percent of incoming students come from North Carolina, with 15 percent coming from 34 other states and countries. First-time, first-year students of color have increased to 22.8 percent of the Class of 2022 and international students this academic year number 36, hailing from countries including Brazil, Germany, Nigeria, Mexico, South Africa, Thailand, and Spain. About 25 percent of incoming transfer students come from Asheville’s A-B Tech. About 42 percent of students entering from high school bring transfer credits and college coursework with them.